This is a series that I’ve had on my Kindle wish list fr ages and ages and just not got around to downloading. When the Zombie Book of the Month club chose a book I’d already read, I though this was a good opportunity to download this trilogy and give it a read. 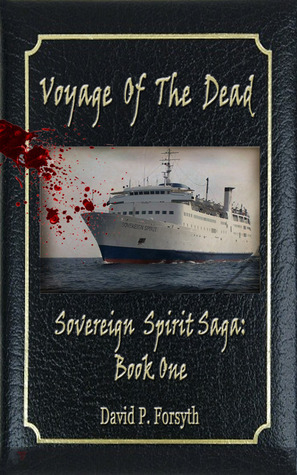 It’s the usual sort of zombie book but with the twist of the main character being on a luxury boat when the outbreak happens. The main character, Scott, won the lottery a little while ago and bought this boat and had it kitted out in luxury and with a whole load of ‘boys toys’ so that he could sail around the world with family and close friends. The outbreak occurred just as they were heading back to the USA. Everything happens pretty quickly in the book and the guys on the Sovereign of the Seas are pretty far removed from the horror happening around the world. They encounter zombies when they go to rescue friends and family trapped on the mainland. The books read really well, and through the three books they encounter more survivors including miliary, FBI, police, mayors and the press. Scott always seems one step ahead of everyone else and makes full use of all his boys toys stashed n the boat. In some case I found him a bit too clever and well-equipped. He always seemed to have just the right piece of equipment stashed away in the hold, or just happens to have a marine laboratory to help the scientists come up with a cure for the virus. There’s not enough of the usual struggle that you have in a zombie novel. However, I really enjoyed the ‘Interlude in Hell’ sections in he first book. Carl is struggling to survive after his wife becomes a zombie. He manages to find his way to a power station and starts to have some good ideas around survival and finds himself leading a band of survivors. This is much more like the usual story of survival when all the odds are stacked against you. Later in the books, Carl meets up with Scott and they join forces. There’s a build up to them both getting together, so you know that it will eventually happen. To be honest, I thought Carl had made a pretty good base at the power station and had picked up groups of survivors along the way. I wasn’t sure he needed Scott. The books are good read. They move at quite a pace. Some of the storyline can be anticipated but there are a few twists and surprises, especially with some of the characters that do die along the way. The way the third book ended, it looks like the will be a fourth book coming along at some point, which I will definitely read!